It's June 2010 in a Reykjavik back street. Three members of Hjaltalín are trying to push-start a knackered-looking minibus. A small group of journalists stand gawping. We're in Iceland to watch the band play a show that night with the 90-piece Iceland Symphony Orchestra, but before that spectacle, Hjaltalín have offered to take us out for a day of sightseeing. The minibus finally sputters into life and we are soon bedazzled by Iceland's jaw-dropping beauty. We play in the ash of the mischief-making – and seriously unpronounceable - Eyjafjallajökull volcano, visit stupendous waterfalls and race across black sands to locate an enormous - and very recently beached - dead shark. And two hours before they are due to play the most prestigious show of their career, several members of Hjaltalín share a sauna with me at one of the country's many lidos. That night, Hjaltalín's visionary take on baroque pop is played out in full. Interpreting songs from their full-bodied second album, Terminal, the Symphony Orchestra help elevate the band to a celestial high. Conducted by the hugely talented Daníel Bjarnason, the band is placed in the epicentre of the orchestra. By the time lead singer Högni Egilsson – who could be Thor's younger hippy brother - strides through the sea of violin players during the thunderous intro of the opening 'Suitcase Man', fat tears of exhausted joy are rolling down my cheeks. It feels like the greatest gig I've ever witnessed at the end of a close-to-perfect day. Fast-forward three years and I'm sat with Egilsson in a Brighton coffee bar. He's just demolished a chocolate brownie and a super-strength espresso. A few hours earlier, I'd watched his band play a lunchtime gig, showcasing songs from their as-yet-to-be-released third album, Enter 4. The songs are simpler and sparser than the playful grandiosity of Hjaltalín's previous work. As the sun streams through the beachfront bar, Egilsson – dressed in a plain white t-shirt – appears momentarily angelic, as the stripped-back tracks flicker into life. "We went as far as we could with the orchestral palette," Egilsson tells me, as he begins to explain the sonic rebooting on Enter 4. "We figured that we didn't want to continue in that direction. We thought, straight away, that we would like to strip it down and get to some sort of a core of an animal-like, primal sound, instead of the florid polyphony and wide array of sounds we'd used previously." I first met Egilsson in 2009, so am used to the Icelander's vocabularic pirouettes. 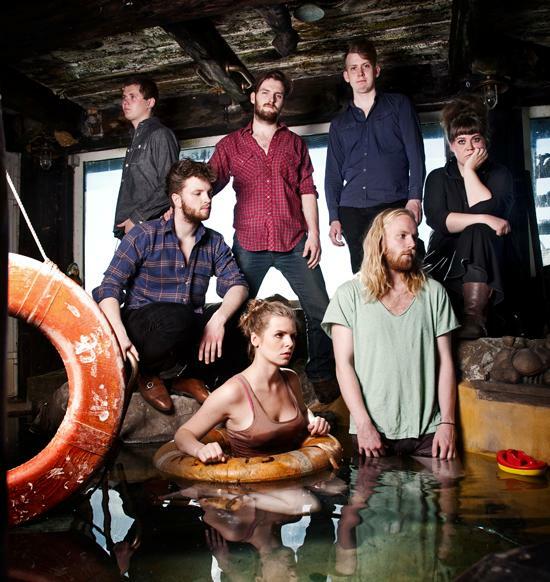 At the time, Hjaltalín had just released their debut album, the chamber pop mini-masterpiece Sleepdrunk Seasons, and were in my hometown of Manchester to play a show. Crammed onto a tiny stage, the seven-piece (the line-up contained a violin player and a bassoonist) produced dancing soundscapes through which the vocals of Egilsson and co-singer Sigríður Thorlacius could leap and bound. On the surface, the minimal electronics that punctuate Enter 4 suggest a brave new direction for Hjaltalín. The recording process "changed from previous albums," reveals Egilsson. "This time we went out to the Icelandic countryside, in the middle of nowhere, and spent time in a small village auditorium. We started writing and developing a new sound. We were experimenting with different instruments and production tools." He is also quick to correct my assertion that Enter 4 is Hjaltalín's 'electronic album'. "It's not an electronic album," he states, "but we did use some samples on the percussion and drums. I became obsessed with metallic noises of high frequency - I liked the eery, clinking sounds." Much of Enter 4 does indeed feel pretty dark. From the opening doom-laden drama of 'Lucifer / He Felt Like A Woman' to the magical finale of the death ballad 'Ethereal', Hjaltalín appear to be revelling in their collective introspection. "We wanted this to be a very human feeling album," Egilsson says. "It's dark and kind of heavy but it also has a heartbeat to it." At this point, I'm surmising that the creation of Enter 4 followed a pretty standard pattern – a band lock themselves away, strip back their sound and deliver a gloomy triumph. I am wrong. Very wrong. As Egilsson finishes his espresso, he tells me just how Enter 4 came to be such a headrush of emotion. "It was a very intense period in my life and our life as a group – as colleagues and friends," he recalls. "In the year that we were making the album I developed a bipolar manic disorder – it lasted about seven or eight months. I became manic and very depressed and the manias I experienced were very frequent. I was exploring and opening passages to somewhere I didn't understand. In some ways, it was a very enlightening era. "The periods of mania would last days and weeks," he continues. "It's quite hard to describe, because for me it's not really possible to explain what I was feeling. It was a life-changing thing, because I was pulled out of my thoughts on what reality is - who you are and where you are going becomes a little bit naked in the ethereal sky. You are flying out and experiencing something which is the borderline between art and insanity." His comments make me think of the track 'Ethereal', a fragile and beautiful ballad and one of the most deeply affecting songs I have ever heard. "I wrote a few of the songs from the album while I was in a psychiatric hospital, including 'Ethereal'. We actually did some demo recording while I was there." Egilsson clocks my look of disbelief. "Yes, the doctors did find that a little bit extreme. But, the band would come over to the hospital and I would play them a few of the songs – it was a very beautiful time. In a way it was a very spiritual experience for me." We talk about other musicians who suffer from bipolar disorder, and I ask Egilsson how his illness affected his band mates. "It was a big thing for us as a group and family. They were worried, of course, as I was going insane. The lows were not good. I had a classic bipolar disorder – I was flying very high and then the lows were very, very depressing. I was on medication for a while and it helped me to get balanced and re-earthed, but now I am off the medication and I haven't had any episodes since. I work with myself every day and try to keep healthy." The news of Högni's illness is saddening, but also sheds more light onto the raw emotion underpinning Enter 4. "We are proud of the album and the lyrics," he says. "The lyrics are all about escaping – we are all desperately trying to discover something, to go through some elusive state and to escape into a dream. The album is about the beautiful and sorrowful aspects of being a human – but it's a hopeful album, I think." I suggest to him that, by losing some of the band's previous orchestration, Enter 4 represents the 'core' of Hjaltalín. "Exactly - it's a little more primal and more earthy. This is what you experience when you escape your own thoughts and open up to everything else - it can be a very great thing to do." I ask about the future. Enter 4 was released in 2012 in their home country, and it's virtually impossible to predict where Hjaltalín's sound might go next. "We are looking out for a new sound and are always trying to go in a different direction and new territories for our songs," Egilsson says. "We don't stop at a point – we've made albums [released] in 2007, 2009 and 2012, and we are always trying to evolve. This is what we do. We are just trying to arrange the notes that are available in the most harmonious way." After finishing our chat about Enter 4, talk turns back to 2010 and the concerts with the Iceland Symphony Orchestra. "They were very special nights," remembers Högni. "They were epic and powerful. On that album [Terminal], the songs were driven by a quite a wide orchestral palette and I think we managed to expand the use of orchestral instruments in a pop-rock setting." I show him a few photos from our day out in Iceland. One of them depicts the singer attempting to jump over the beached shark. "That was a very big dead shark," he reflects. "And definitely the biggest shark I have ever jumped over." For both Egilsson and Hjaltalín, it seems that every day provides a chance for new experiences.